Full Circle Podcast Episode 22, Mad Max Meets Ben Hur is available now from the Full circle Site. In this episode, all things Chrome. Ubuntu One File Android App finally available! 36:51 | OPINION: All things Chrome: Ed's Samsung Chrome notebook. ChromeOS marches on, but for how long? In Digital Watermarks Part One, we looked at the need for digital watermarks and the simple steps to impose a visible watermark onto a digital image. As we found last time, a visible watermark placed in the center of the image is really difficult to erase and will remain even if someone crops the image, but it spoils a good composition. Time to go invisible. With the right algorithms and tools you can embed an entire library of information inside a high resolution photo and not alter the visible image. 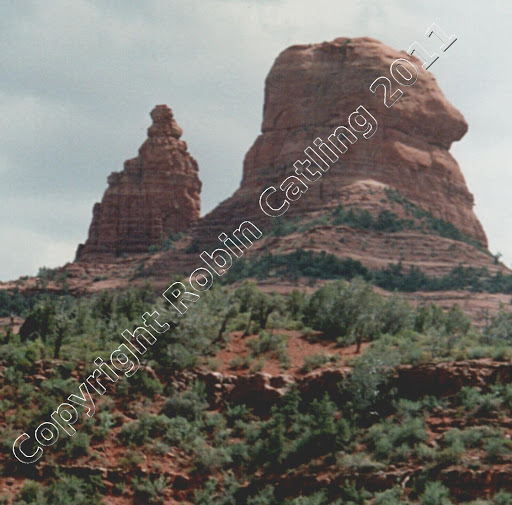 At the high-end, digital watermarking involves cryptography and complex algorithms that are way above my pay grade. The trouble with this method is the variety of image processing which can unintentionally or intentionally attack a watermarked document and render the watermark undetectable. High quality images are often converted to JPEG format to reduce their size, by which the data compression can destroy the watermark. Horizontal or vertical flipping, rotation and cropping can also render an invisible watermark undetectable. 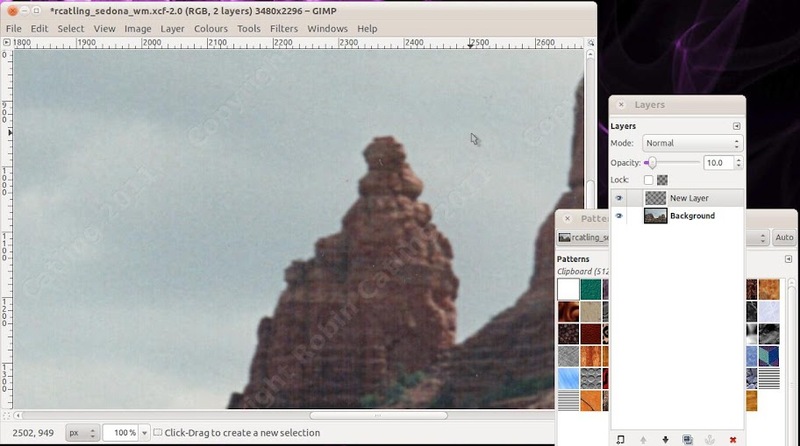 However, if you feel the need to add a simple, hidden watermark to your images using the GIMP, Gnu Image Manipulation Program, let’s give it a go. There are various techniques documented on the Web, none of them foolproof; this one mostly works but not in all cases. We’re going to create a watermarked copy of an image and use the original as the key to reveal the hidden mark. I’ll assume some basic familiarity with the GIMP and that you read Part One. Open the GIMP with a new transparent image. Create a text layer for your copyright assertion using a clean, legible font. Text layers have peculiar properties, so Merge Down the text layer onto the transparent background.Next, convert your image to a pattern. Go to Select Menu, All (or use the shortcut Ctrl – A) and copy to clipboard. Using Windows, Dockable Dialogs, Patterns, open the Pattern palette. This is pre-populated with the sample patterns that come with the GIMP. Click the Auto button and GIMP will automatically pickup the selection as a pattern for immediate use. The first pattern in the grid will be the selection you’ll use as the watermark. As it has a transparent background you’ll probably see a blank white square, make sure it has the heavy black border indicating it’s active and it says ‘Clipboard ( 512 x 492)’ where the numbers are the dimensions of your watermark selection. Open the image you want to watermark and create a duplicate of it, Go to Image, Duplicate (or press Ctrl – D. Save it under a new name – don’t mess up your original image, you need it for use as the key! Create a new layer, make sure it’s highlighted as active. Go to the Pattern palette and perform a click-and-drag on your watermark pattern, dragging it over the image to be marked. The Pattern function should automatically tile this across the whole image. The next step is more experimental. Reduce the opacity of the pattern layer so that it is no longer visible but but DON’T set it to zero. Zoom in play with the opacity settings, keep it as high as you can without the pattern becoming visible with your Mark I human eyeball. Between 2 and 10 is good. 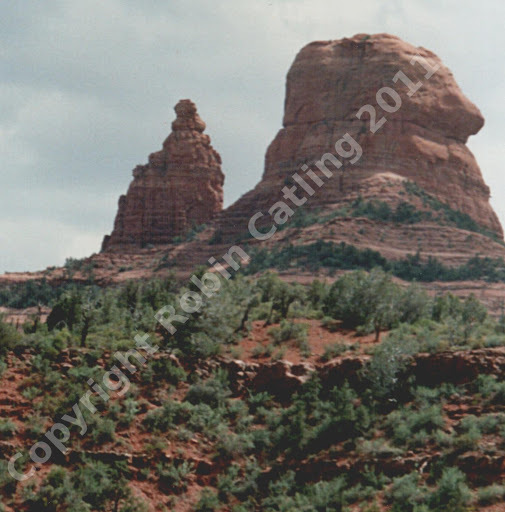 4.0 worked on my Sedona landscape. Save this version as the one you’ll post to the public. This should work for .png and .jpeg files (but only if you keep the compression to a minimum). The day comes when some despicable cad rips one of your images and you need the evidence to go before the Bench. 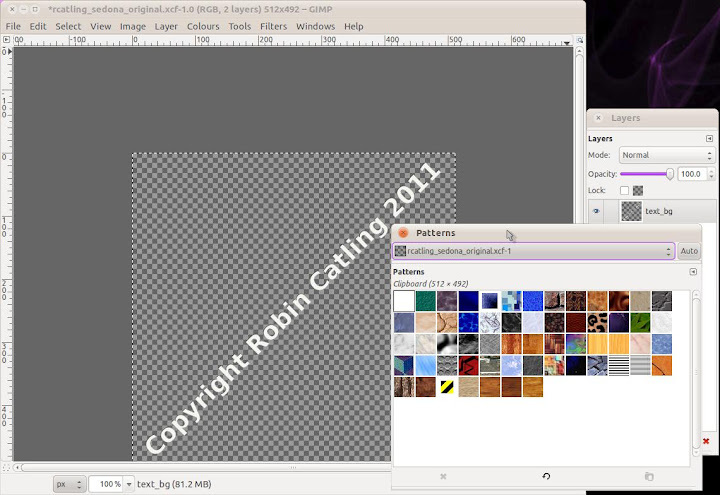 In the GIMP, paste your original and the swiped, watermarked copy as separate layers into one image file. This is what they call on the TV makeover shows ‘the reveal.’ In the Layers palette, highlight the upper layer as shown in the attached and set its Blend Mode to Grain Extract. What this does is subtract all the common elements in both images, leaving only the differences visible; in this case your copyright assertion! Drum roll, please, I thank you! You may find that Blend Mode, Divide also reveals the watermark, depending on the image. Saving your images as .jpegs with high compression will introduce what are called compression artifacts; the data lost in the process can be enough to destroy your hidden watermark. The enterprising thief will often convert images between formats and scale to low resolutions, destroying the watermark in the process. You can try different fonts, font sizes and colors in your patterns which may work better or worse with the different images you are marking. Go for contrasting watermarks against the dominant shades in your images, light-to-dark, dark-to-light. 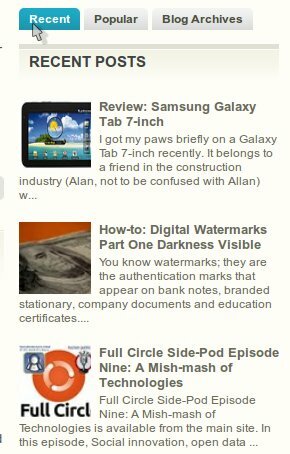 At the beginning of the month, eagle-eyed readers of my Blogger site will have noticed up to three "Recent Posts" widgets on trial in my layout. This is purely down to the fact that all of the Recent Posts, Recent Posts Advanced widget and another custom feed method all broke down in the updated version of the Blogspot platform and nobody seems interested in fixing them! One is to create a simple feed for recent posts; from the Blogger Dashboard, Add a Page Element, add a Feed (click “add to blog” under the page element Feed), configure the feed by adding the blog feed URL in the box: http://catlingmindswipe.blogspot.com/feeds/posts/default?alt=rss. Click Continue, change the title, save it, done! You can also choose to show the item dates and author. I found emptying the value for height worked and 6 recent posts gives me a decent list length. Use this code if you don’t want post snippets to show. Only thumbnails and titles will show. I got my paws briefly on a Galaxy Tab 7-inch recently. It belongs to a friend in the construction industry (Alan, not to be confused with Allan) who initially raved over it and in two weeks began fault-finding. 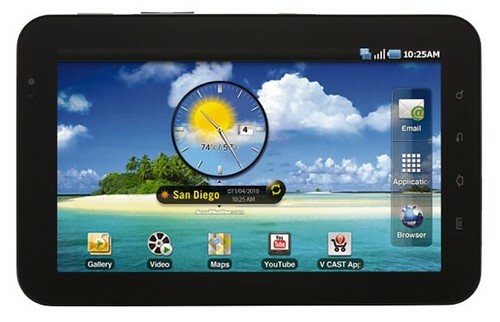 This is one of the tablet devices released in response to Apple's iPad. It was a fine alternative to the iPad-I in terms of it's market pitch, but since the iPad-II came out, it looks like an expensive me-too with a smaller screen. The question is, has Samsung compromised too far in the attempt to be distinctive...? 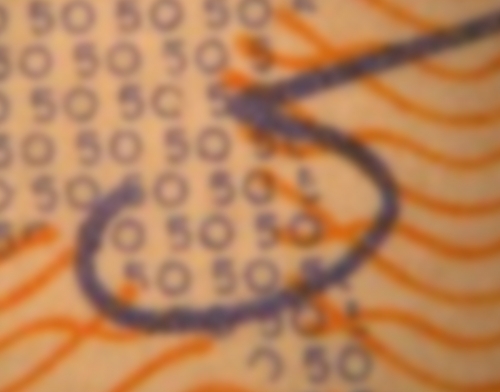 You know watermarks; they are the authentication marks that appear on bank notes, branded stationary, company documents and education certificates. Those are the visible watermarks we see everyday. Hold up a bank-note to the light and there it is, molded and imprinted into the paper. Digital watermarking is the extension of this utility into the digital world. It is easy to reproduce and distribute identical copies of digital information, be it images, text or audio. There is no shortage of data bits, as the entertainment industry has discovered – or anyone who shares images from their digital camera. 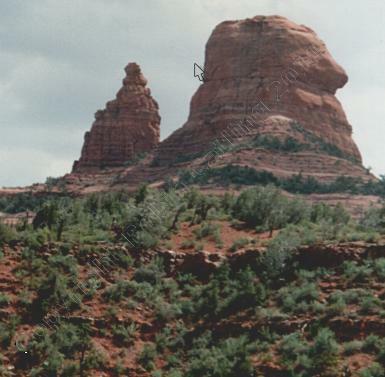 You might think fraudulent use of digital photos is somebody else’s problem. Leaving aside the large travel companies I’ve worked for, which have large and expensive image libraries, I know several freelance photographers for whom it’s a real concern. Put an image gallery up on the web and it will likely be indexed by the search engines, where less than scrupulous people can find it and ‘rip’ it for free, passing it off as their own and maybe making money off your work. The answer is to watermark your digital images. There are two ways to do this; visible and invisible. We’ll look at invisible watermarking in part two. For all digital photos, you can put an invisible copyright in the Exif/IPTC fields of the image file. Most digital cameras can be set up to insert a copyright statement automatically. 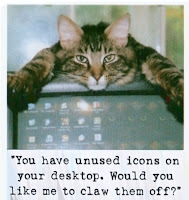 The trouble is there are lots of free image-editing utilities you can use to take it out in one click. 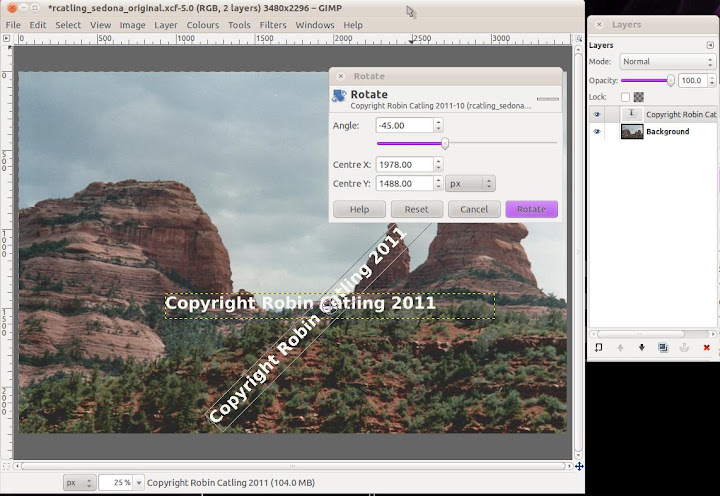 Onto a practical example using the image editing application The GIMP, the GNU Image Manipulation Program. I’m no artist and there’s usually a dozen ways to get the same result in the GIMP; these are mine. Open your photographic masterpiece and immediately Save As… or Save A Copy so you don’t mess up the original and can keep additional layers. You will need the Layers palette so press ctrl – ‘l’ to open it if it is not already visible. Create a text layer for your copyright assertion using a clean, legible font in a contrasting color appropriate to the portion of the image over which it’s placed. Watermarks are typically colored along the grayscale between black and white. Any other text color will require you to use the Value mode in your Layers dialog. Choose your text foreground color first, then select the Text Tool icon, it’s the full black ‘A’ in the Toolbox. Alternatively press the ‘t’ key. You can use the Character Map application to find and include the Copyright mark ©. Size and position it within your image. If you want to make your watermark more robust, you could use Layer, Transform, Arbitrary Rotation, Angle -45, to place your watermark diagonally, which defeats removal by edge-cropping. Change the layer mode to Overlay which achieves a similar result in one click. Filters, Map, Bump Map. The previews doesn’t show much, but hit OK and what you get is a subtle text outline of your copyright statement floated over your image. We can make something a little stronger than this. Undo the Bump Map filter, we’ll go again. Add a new layer below your text layer, filled with 50% gray (127,127,127) and then Layers, Merge Down your text layer. Select the text; Select, By Color. Now you have the selection, you can delete the text to leave its outline. Now select the gray background and delete it. This gives you a beveled watermark. You could achieve something similar with the Emboss filter. When you’re happy with your watermarked version, go to the File menu and choose Save As. 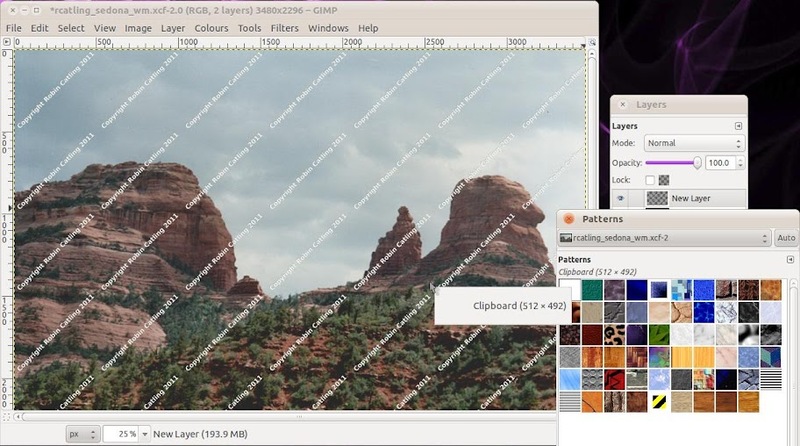 If you save the image as a .peg or .png file for use on the web, the GIMP throws a dialog telling you those formats can’t handle layers and you need to flatten the layers. This isn’t your master copy, so that’s okay… right? Full Circle Side-Pod Episode Nine: A Mish-mash of Technologies is available from the main site. In this episode, Social innovation, open data and FOSSbox. 01:55 | Feedback on the OpenTech Conference 2011, Saturday 21st May 2011. Fossbox is a non-profit organisation supporting digital inclusion and helping other non-profits move towards lower-cost ICT systems with more flexibility and lower environmental impact. Founded in 2004, we’re a not-for-profit organization promoting open knowledge: any kind of data and content – sonnets to statistics, genes to geodata – that can be freely used, reused, and redistributed. We promote open knowledge because of its potential to deliver far-reaching societal benefits. Confusion persists over what you can and can't do on Wordpress.com, that's the free service for Wordpress blogs hosted by the Wordpress folks themselves out of the goodness of their hearts. They run the advertising, they get the revenue. It should all be very straightforward but the rules don't seem to be encapsulated neatly in one place where we can all see them. Which blogs are allowed to use AdSense and Skimlinks? Those would be the blogs with high traffic of 25,000 or more page views a month. VIP blogs like CNN and the NFL, paying $2,500 a month, can run their own ads. If you do get over the magic 25,000 mark, you can qualify for ads at a 50/50 split with Wordpress, but the amount varies with the click-thru rate. Don't give up your day job. There are further conditions for use of AdSense and Skimlinks, which are allowed only for blogs with real content, not skimming, hyping or solely for advertising product and definitely not spamming. The WordPress.com Terms of Service on Advertising is the usual 'EULA minefield' and Wordpress gets to decide what's appropriate not you. You fill in a form on the Terms of Service on Advertising page to apply. WordPress.com will review your blog and approve or deny you. You also have to sign up for AdSense and Skimlinks accounts. You have to get approved for the latter as well, but both should be free. After you get approved, Ad Control appears under your Settings menu when you log into WordPress.com, where your account ID's are entered. In summary, free blogs hosted by Wordpress.com cannot be used to drive traffic to third-party sites by means of advertising and/or affiliate programs. E-commerce transactions via shopping carts and the like cannot be conducted on wordpress.com blogs. No retailing or reselling the work created or services provided by anyone other than yourself is allowed. "Affiliate marketing blogs: Blogs with the primary purpose of driving traffic to affiliate programs and get-rich-quick schemes (“Make six figures from home! 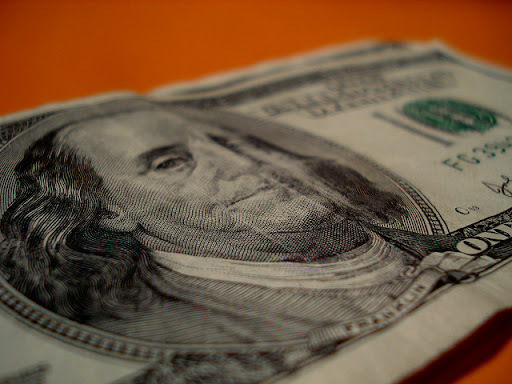 !”, “20 easy steps to top profits! !”, etc). This includes multi-level marketing (MLM) blogs and pyramid schemes. To be clear, people writing their own original book, movie or game reviews and linking them to Amazon, or people linking to their own products on Etsy do NOT fall into this category (http://en.wordpress.com/types-of-blogs/)." You can link to reviews in your actual post; book reviews, gear reviews and the like, but nothing is allowed in the sidebar section. "If you write reviews for product on Amazon.com, it's ok to use their image and add an affiliate link.Other forms of advertising (including sidebar widget with Amazon affiliate links) at WordPress.com is not allowed. If you require an ecommerce site, advertising and/or affiliate links on your blog, you can hire a web host and get a free software install from http://wordpress.org. The information at http://support.wordpress.com/com-vs-org/ outlines the differences between free hosted WordPress.com blogs and WordPress.org software installs for self hosting. 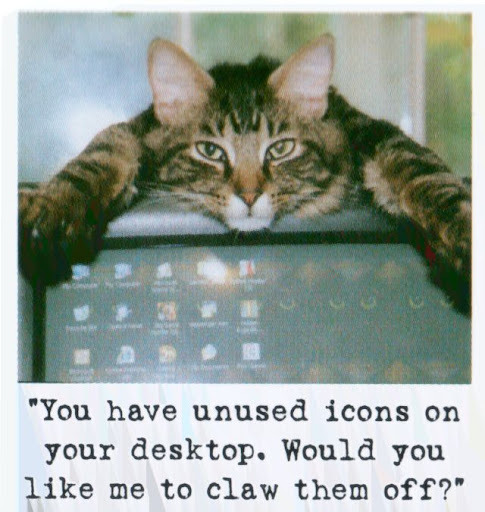 Yes, it's desperately close to the LOL Cats of 'I can has cheezeburger,' but I was given a copy of the 2011 Bad Cat Calendar from Workman Publishing and I happen to like July 23rd's cat. "Normal service will be resumed just as soon as we've worked out what's normal anyway."